Can there be a healing crisis with Genesis Gold? My own healing transformation lasted a couple of months after starting Sacred Seven®. 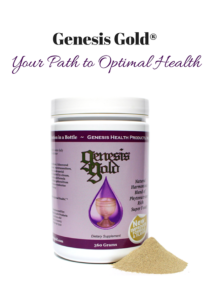 Sacred Seven® was first since it took me three years to find a manufacturer for Genesis Gold®. The weird dreams and mood swings as your subconscious beliefs begin to surface so they can be transformed. Your hormonal re-calibration will be like the dynamic sounds produced by instruments being tuned. Your periods are off, your body temperature is wacky, your moods, motivation and libido are shifting. It will come together eventually. Your body just takes time to come into complete harmony. The longer you’ve been out of balance, the longer it takes. Now some people feel immediately better! They’re not the ones who get the most benefit from Genesis Gold®. The ones who don’t notice much at first make greater health changes. The ones who seem to get worse before they get better, experience the most transformational shifts in their health and wellbeing.